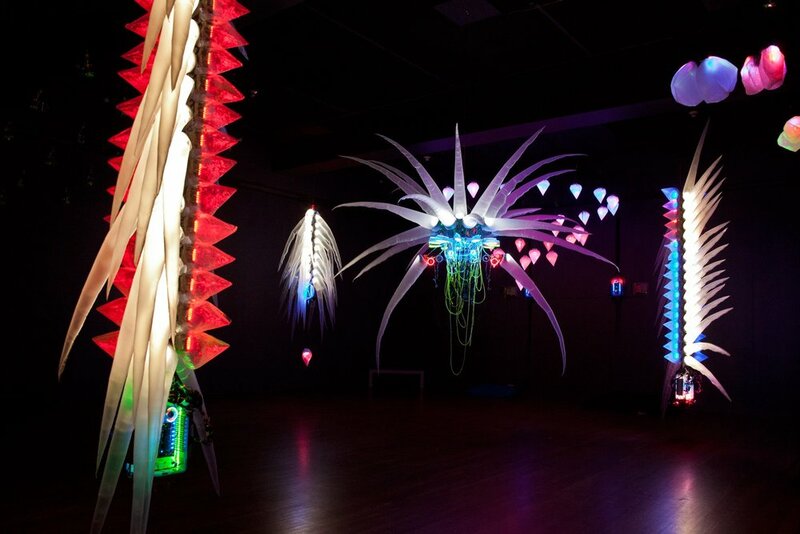 Where others see trash, mundane household items or random electronics components, New York City–based artist (and TED Fellow) Shih Chieh Huang sees the possibility for glowing, waving, whirring, multi-tentacled creatures (TED Talk: Sculptures that would be at home in the deep sea). His kinetic structures — which look like flora and fauna harvested from an otherworldly ocean — are made out of items like toys, plastic garbage bags, Tupperware, computer fans, rewired circuit boards and fluorescent inks. With his finds from dumpsters, dollar stores, supermarkets and other places, he repurposes, redesigns and reanimates materials into pieces that can inspire us to reexamine our relationship to the objects around us. Reusable Universes — an exuberant installation featuring dozens of pieces, large and small, of his work — is on view at the Worcester Art Museum in Massachusetts through November 12, 2017. He explains the origin and construction of his magical creatures. Organic Concept, made from painter’s plastic and “breathing” with the help of box fans, winds its way through the Renaissance Court of Worcester Art Museum in Massachusetts. Components of Huang’s sculpture VT-34-BTB (Red Angel Eye) include trash bags, LED lights, plastic sheets, a Tupperware container and computer cooling fans.